IK Multimedia announces Syntronik® Deluxe, the expanded version of the legendary synth powerhouse for Mac® and PC. It adds five new synths, available both as a collection or as separate synths. 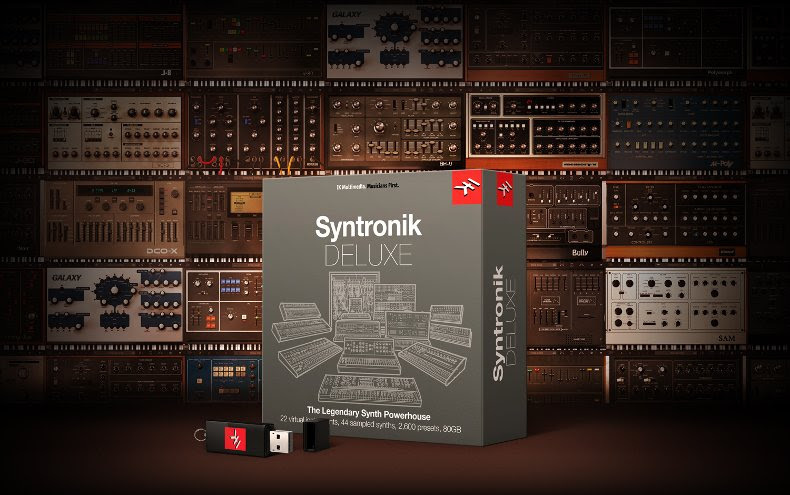 Current Syntronik users can upgrade to Syntronik Deluxe or purchase any of the new synths individually. Syntronik offers the definitive and best-sounding collection of vintage synthesizers in a virtual instrument to date, covering a wide selection of the most iconic to ultra-rare vintage synthesizers of all time. Syntronik Deluxe adds 500 new instrument presets, 18GB of new sounds, and more than 22,000 new samples for a new total of 22 synths, 2,600 instrument presets, 80GB of sound content and more than 120,000 samples. Memory-V: IK's take on the legendary Memorymoog 6-voice, 18-oscillator monster analog polysynth from the USA. It features 148 instrument presets, 5GB, over 6,000 samples. SH-V: Based on two highly-stylized two oscillator Roland® monosynths, the SH-5 and SH-2 from Japan. It features 100 instrument presets, 4GB, over 5,000 samples. M-Poly: Based on two iconic Korg® SSM-based signature sounding analog legends, the Mono/Poly and Polysix from Japan. It features 100 instrument presets, 4GB, over 3,000 samples. Modulum: Analog modular drums and percussion created with interconnected Modular Moog®, EMS VCS3 and Alesis® Andromeda synths. It features 108 instrument presets, 400MB, over 2,000 samples. All of the Syntronik synths accurately recreate the actual sound of vintage synthesizers using a combination of sampling and modelling to ensure truly authentic results. IK's proprietary DRIFT™ technology varies the phase, colour and pitch of the sampled oscillators in a subtle fashion to keep them moving just like real analog oscillators. An analog modelled filter section offers seven filter types, with mix and match capabilities, for pristine reproduction of the most critical section of every synthesizer, and unique combinations never heard before. Included are four analog-modelled filters (M-Type, O-Type, R-Type and C-Type), plus a Classic multimode filter and powerful digital filters like Formant and Phaser that can take the analog source oscillators into a whole new world of sonic possibilities. Also onboard is a full suite of 38 professional effects with a lunch-box style configuration that is unmatched in the world of virtual instruments, along with advanced features like 4-part layers, splits and arpeggiators. Syntronik's instruments and multis can be opened seamlessly in SampleTank 3 (version 3.7.2 or higher), allowing them to be used individually or as 4-part instruments together with the vast and continually expanding range of instruments available in the SampleTank library. Users with qualifying IK products can crossgrade** to Syntronik Deluxe and get the full collection for $/€269.99. New users can get Syntronik Deluxe $/€399.99.